The world is a quieter place without the UFC but after a two week hiatus, the premier MMA organisation is back with a bang. The promotion heads to Dallas, Texas this weekend and they are bringing with them a blockbuster card as UFC 211 is undoubtedly the most talent-rich event of the year so far. Topping the bill is a heavyweight title clash between Stipe Miocic and Junior Dos Santos while the co-main event sees Joanna Jedrzejczyk defend her women’s strawweight title against Jessica Andrade. Sport360’s in-house MMA expert, Alex Rea, explores the five key questions ahead of the event. Will the sequel be better than the original? 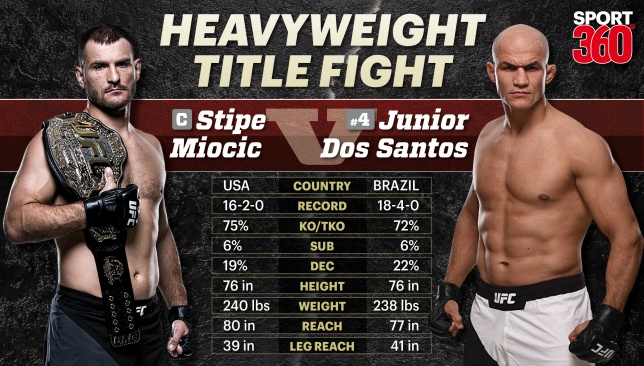 In December 2014, Stipe Miocic and Junior Dos Santos went to war. Over the course of 25 minutes and five rounds, the then top contenders, both with some of the most technical boxing in the division, put on a display which showcased the very best of heavyweight mixed martial arts. Dos Santos took a unanimous decision the night – albeit a close one – but the pair’s paths took decidedly different turns after that fight. For Miocic, it inspired a tear through the division with wins over Mark Hunt and Andrei Arlovski culminating in his stunning knockout of Fabricio Werdum in Brazil last May at UFC 198 to become the heavyweight champ. He defended the belt against Alistair Overeem in September and now has come full circle with circumstances bringing us a rematch with Dos Santos. The Brazilian has had an element of luck in getting his shot at reclaiming the belt he lost in 2012. After the win over Miocic he stumbled with defeat to Overeem but got back on track with a pulverising performance against Ben Rothwell. The 33-year-old was then slated to fight Stefan Struve but a series of changes opened the door to a second meeting with Miocic but unlike most sequels this one won’t disappoint. Is 2017 to be the year of Joanna Champion or will Andrade put the brakes on? For strawweight queen Joanna Jedrezejczyk there’s more than just her crown on the line against Brazil’s Jessica Andrade. Indeed, 2017 could stand to be the bookmark of her legacy as the punishing Polish champ closes in on Ronda Rousey’s prestigious record of six straight title defences. The 29-year-old is just two away from achieving the symbolic feat having ripped through the 115lbs division since claiming the belt just over two years ago. But it’s not just etching her name into the record books which is on the horizon. The UFC confirmed this week that it will add a women’s flyweight class later this year and it offers Jedrezejczyk the opportunity to fulfill her lifelong ambition to be a two-weight UFC champion – a target for which she revealed last year. First, though, is a challenger who presents plenty of problems. Andrade has been deeply impressive since dropping down from batamweight as she earned her shot at the champ with three straight victories at 115lbs. The 25-year-old offers a combination of the two toughest opponents Jedrezejczyk has faced so far as she possesses both the power-based grappling of Claudia Gadelha and the striking skills of Karolina Kowalkiewicz. Still, Jedrezejczyk’s precision, pressure and pace make her a firm favourite and should she come through another title defence with the belt intact and she is set up nicely to make 2017 her own. 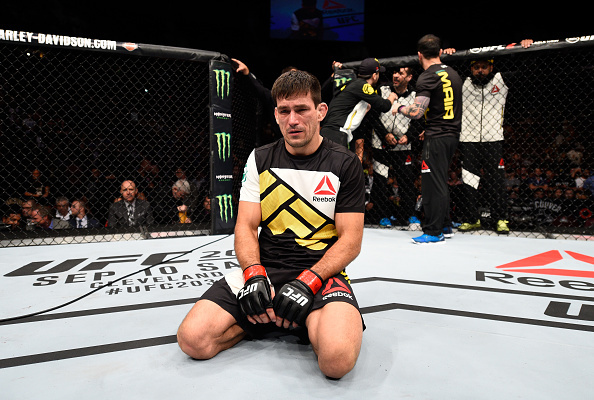 Should Maia have taken this fight? The short answer: no. MMA is a cruel sport at the best of times. It doesn’t care for storylines and it doesn’t care about merit. Maia has more than earned his shot at the welterweight belt and yet, here we are, with another dangerous opponent in front of him and the potential for his title run to be derailed. The Brazilian has choked his way to a top contender’s spot with notable wins over Gunnar Nelson, Carlos Condit and Neil Magny during a six-fight win streak. But despite being widely acknowledged as next in line for the winner of Tyron Woodley and Stephen Thompson he accepted a fight with Masvidal. Of course, Woodley defended his belt at UFC 209 and is now back in camp awaiting his next assignment while Maia looks to rubber stamp his title claim. At 39 years old, though, this is a do or die fight for Maia and Masvidal will be no easy target after reeling off three straight wins. The best outcome for Maia is that he is able to utilise his jiu-jitsu – widely accepted as the best in the UFC across all weight categories – to get the job done quickly and cleanly. The worst, he’s defeated and his title dream fades into the ether. Will Edgar prove he’s still among the best or can Rodriguez come of age? The UFC is littered with examples of clashes between the young and the old, the prospect versus the proven and another is set to take centre stage at UFC 211. Mexican flyer Rodriguez takes on former lightweight champ Edgar with a place in the upper echelon of the featherweight division up for grabs. Since losing the 155lbs belt over five years ago, Edgar has dominated the division’s top contenders but has twice fallen short of becoming a two-weight champ against Jose Aldo. Rodriguez on the other hand, has displayed some serious athleticism combined with a ridiculous high pace to quickly endear himself to the fans and has shot up the 145lbs rankings. It’s a fight in which ‘Pantera’ can prove he deserves a shot at the winner of Max Holloway and Aldo at UFC 212 while Edgar is out to simply prove he deserves to remain alongside the very best in the division. 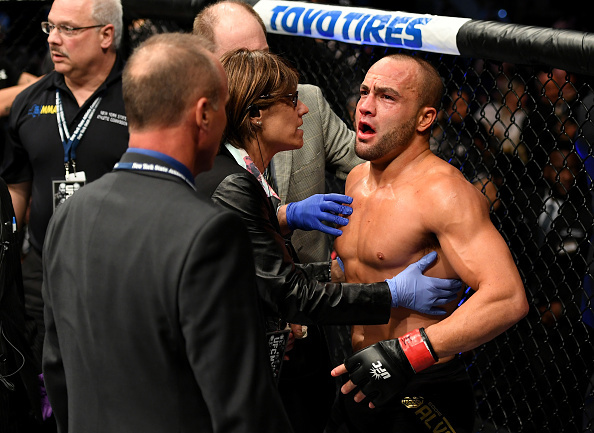 Eddie Alvarez gave a hugely refreshing soundbite to journalist Luke Thomas this week as he opened up about his defeat to Conor McGregor at UFC 205. He said: “I think there’s a freedom in having your worst nightmare come true. As a fighter, your worst nightmare is to get knocked out in front of millions of people. That’s like the dream of waking up naked in your classroom. That type of perspective shows the former lightweight champ is mentally in the best shape possible. He needs to be, too, because Poirier is coming off a big win against Jim Miller and has won five of his past six matchups. As a boxer, Anthony Joshua is far from perfect. The nature of his victory over Wladimir Klitschko on Saturday, however, could not have been more perfect for his career. In fact, it was arguably his imperfections which helped to create what was an instant classic. Take for example, his weight. Joshua looked a little bit on the heavy side and the extra poundage contributed to his titanic tussle with fatigue in the middle sessions. But that flaw allowed Joshua to impress because it answered the doubts about his gas tank as he managed his energy, recovered, got his second wind and finished the job to display new a level of maturity. It added to the tension, too, as did his lack of focus at times, particularly in the fifth when he appeared to celebrate after dropping Klitschko. It led to that monstrous right-hand from the Ukrainian in the next stanza, yet that fault allowed him to show that underneath the hulking muscle is a heart just as strong. Indeed, the 27-year-old has his doubters and until Saturday there were questions lingering over him but after that performance and after gaining that experience, he will now be asking a few of his own, like ‘who can stop me?’. Tyson Fury and Deontay Wilder are two rivals who could have something to say about that, but there’s no getting away from the fact that Joshua is now one of the biggest names in boxing – if not the biggest with Saul ‘Canelo’ Alvarez his only rival. His sweet blend of savagery in the ring and sincerity out of it, has won the hearts of millions, not just in the UK but crucially after this victory in the US as well, and it means his target to be the first billion-pound British athlete is a realistic ambition. He was already a marketing dream but to rise up from the canvas, finish one of the best heavyweights ever having only nine years ago laced up gloves for the first time, Joshua is now on another level. And the frightening prospect is that he can get better because make no mistake, there are technical deficiencies to work on. Joshua’s footwork is still flat and his head movement still too static but his power masks those weaknesses, as does his mental fortitude. 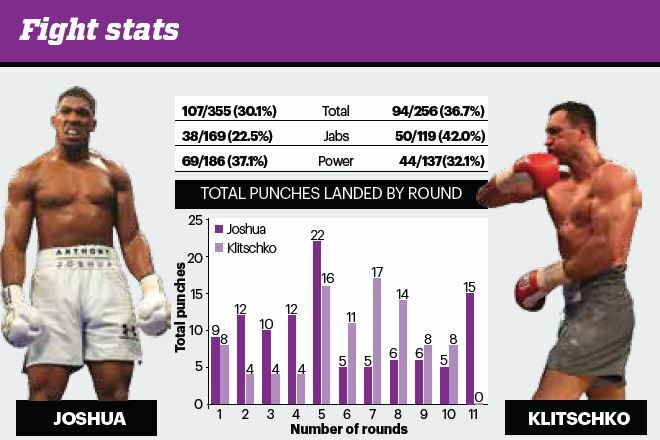 But ultimately having fought 20 percent of his rounds in the pro ranks with Klitschko, Joshua was given the perfect learning experience. “I fought the better Wladimir Klitschko, not the complacent one, the guy who realised his mistakes and wanted to put it right,” Joshua said. “Maybe against anyone else in the division he may have come out on top. I have the ultimate respect for what he’s achieved inside and outside of the ring. I wouldn’t mind fighting him again; if he wants a rematch no problem. “I’m happy, if anything, that it was a great fight, because there was a lot of hype, a lot of attention around the fight, and I’m glad it lived up to expectations. “(I learnt) that I can knock out anyone. If I can keep on improving on the things I do well, I can definitely knock out any opponent. Anthony Joshua and Wladimir Klitschko after the fight. 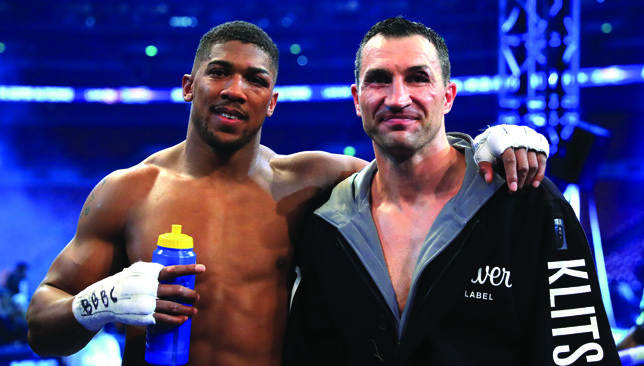 While Joshua defied his age from a mental perspective on Saturday, Klitschko did so in the reverse from a physical standpoint. The Ukrainian deserves a massive amount of credit because at 41 years of age he bounced and bobbed around the ring for 10 rounds with a 27-year-old phenom. Arguably, it was his fight to lose after the sixth round knockdown but his failure to go in for the kill in the ensuing rounds led to his downfall. Still, we witnessed one of the best versions of Klitschko, helping to fade away the memory of his tepid display against Fury. His aggressive approach and valiant effort will have no doubt altered the negative perception created by his jab and grab tactics and now he’s left people wanting more after a time when they wanted no more. “I am not going to consider anything or be making any statements right now,” he said when asked if retirement loomed. “It’s too early; I actually feel pretty good, considering I lost. I will take my time. I have a rematch clause which I can execute at certain times, and right now will not be making any decisions. 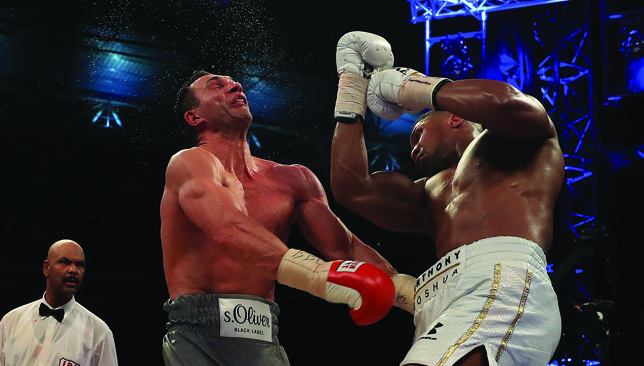 Anthony Joshua’s stunning 11th round stoppage of Wladimir Klitschko was a rarity in this modern era of prizefighting – a blockbuster bout which more than lived up to the hype. Two years ago, an ultra-cautious Floyd Mayweather and a secretly-injured Manny Pacquiao contested the mother of all stinkers in an event which smashed all records but left a global audience shortchanged and disgruntled. This couldn’t have been more different. This was an instant classic, a throwback, boxing at its cinematic best. It was the type of fight which draws new fans to the sport. This was the rebirth of boxing’s marquee attraction – the heavyweights. Precious little in the whole of sport is as intoxicating as a genuine heavyweight thriller, and this one was played out in front of 90,000 live spectators and tens of millions more watching in over 140 countries worldwide. 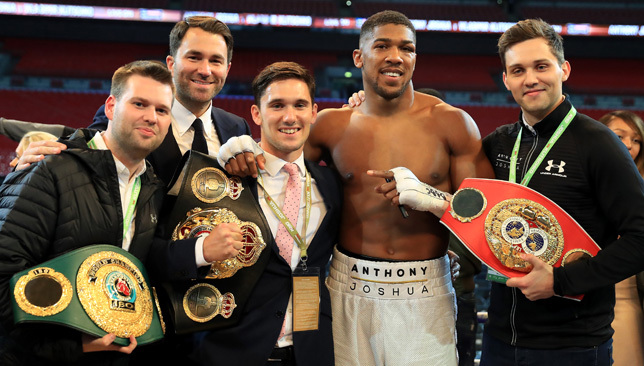 This was both a tipping point for Joshua’s mass appeal and a watershed moment in the recent history of boxing’s top division. The emergence of names like Joshua, Tyson Fury, Joseph Parker and Deontay Wilder has seen interest in the big men rekindled. On Saturday night, it caught fire. This crop may not be on the same level as the fabled names of yesteryear, but is surely a massive improvement on the endless line of one-dimensional suspects who have been sleepwalking into Klitschko’s fists for more than a decade. And in Joshua, this new generation has a leader. A transcendent star with global appeal who has the potential to restore heavyweight boxing to something like its previous popularity. Former champ Lennox Lewis was still “buzzing” last night as he sent out a series of tweets which encapsulated how most boxing fans were feeling. Almost 24 hours had passed and he was still trembling with excitement, unable to come down off of an almighty high. Lewis had been sat ringside to watch the biggest heavyweight event since he knocked out Mike Tyson 15 years ago, and as it turned out, by far the best title fight the division has produced since he and the elder Klitschko sibling, Vitali, exchanged blows in five furious rounds in his final fight in 2003. Lewis is often referred to as the last of the great heavyweights, such was the paucity of entertainment during the Klitschko era which followed his retirement. The Ukrainian brothers will go down as all-time greats for their sheer dominance, but there’s no hiding the fact that in their hands, the heavyweight championship of the world went from being the most prestigious title in all of sport to virtual obscurity, a faded trinket fought over in the provinces of Germany to little or no acclaim. And as Vitali retired and Wladimir grew older and more cautious, the knockouts dried up and what little interest remained evaporated. It was bad enough that the result was predeterminable, but without the consolation prize of a brutal finish, the tedium became almost unbearable. Fury’s victory over Klitschko in 2015 cracked the division wide open and restored its unpredictably. Joshua has brought back the glamour and the knockouts. Klitschko also deserves immense credit for his role in Saturday’s drama, his rare preference for a bold approach finally bringing the fanfare his talent deserves. It also proved once again that in boxing, legacies are built on much more than just a flawless record. He’ll give a rematch serious consideration, but AJ has options. Wilder looms up ahead in a fascinating UK/US showdown, while the biggest fight to be made would be if Fury could return fit and healthy to settle a rivalry which has been simmering away. These are no longer merely big fights in the division, these are some of the biggest fights in the whole of boxing. The heavyweights are back.